The death of 24 year-old Iranian asylum seeker, Hamid Kehazaei in Brisbane on 5 September has again brought home the horror of offshore processing. Hamid’s life support system was turned off after he was declared brain dead after being brought from Manus Island suffering from septicaemia—blood poisoning—as a result of an infection spreading from an injured foot. He had been on Manus Island one day short of a year. True to form, Morrison dismissed Hamid’s death saying that 1200 people die from septicaemia in Australia each year, and, “This is just a very sad event.” But virtually no 24 year-olds die of septicaemia in Australia. The 1200 deaths Morrison refers to are almost all people over 65, getting antibiotic resistant infections in hospitals. Morrison went on to say, “When someone becomes ill they receive outstanding care from the people who work as part of our mainland detention network.” But the truth is very different. There are between 25 and 30 people receiving medical attention in Port Moresby or Australia because the medical facilities on Manus are inadequate. Hamid is a victim of the deliberate negligence that is a systemic part of the detention regime. In the first month of being on Manus, Hamid developed severe skin rashes that were never properly treated. Two months before he died, an IHMS doctor told him it was a reaction to the weather! But there is an epidemic of skin diseases on Manus Island. The heat, the water shortages, the lack of soap powder, the lack of shoes, the fact that some asylum seekers have to walk through raw sewage when it rains or there are high tides—all of this makes Manus, an unhygienic, unhealthy, unsafe hell-hole. There are more than 1000 potential Hamids still imprisoned on Manus. Nothing has changed since the death of Reza Barati—except there is now a four metre high fence surrounding the detention centre. Inside the heightened misery continues with revelations of the use of an isolation unit named “Chauka” for detainees regarded as troublemakers, and numerous self harm and attempted suicide incidents. 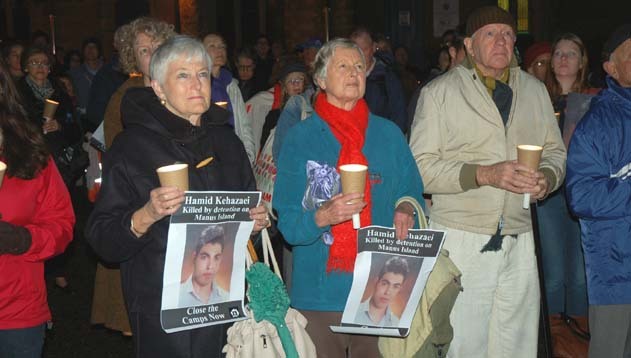 Hundreds of people attended vigils and protests around Australia in sympathy with Hamid and to call for Manus and Nauru to be closed. But Hamid’s death has also revealed the bankruptcy of Labor’s support for offshore processing. In the wake of Hamid’s death, the best that the Opposition Immigration spokesperson, Richard Marles, could do was express Labor’s “strong concerns for the lack of transparency” regarding the treatment of asylum seekers. Marles said, “Every single Australian-funded facility must be run in a manner that is safe, humane, dignified and allows for proper oversight.” That rules out Manus Island – and every other detention centre. Marles told the National Press Club in June that, “We support offshore processing at Nauru and Manus Island as a step which has saved lives.” But not the lives of Reza Barati or Hamid Kehazaei. There is no justification for Manus Island—offshore processing has taken lives not saved them (see p27). Hamid’s death drew renewed international attention to offshore processing and Australia’s abuse of asylum seekers. In the aftermath of Hamid’s death, the new UN High Commissioner for Human Rights, Zeid Ra’ad Al Hussein, said Australia’s policy of offshore processing and its interception and turning back of vessels “is leading to a chain of human rights violations”. Meanwhile, the horror of Hamid’s death led thousands more people to sign the joint RAC/GetUp petition to close Manus Island. At one point signatures were being added at 1000 an hour. The petition (bit.ly/1uVnkgd) now has 92,000 signatures and continues to grow. Both Sydney and Melbourne are holding “Stand Up for Refugees” rallies on 11 October that will call for the end of offshore processing.